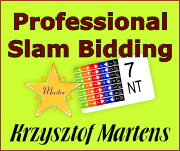 New book Professional Slam Bidding Part I & II is now available. There are some insights about its content in previous article NEW BOOK 2014. You can have them in paperback or PDF formats. PDFs are in english and spanish. I’m planning to release chinese version too. Each printed book is accompanied with special set of training materials. Paperback copies are provided with CDs containing these materials. PDFs do NOT include them. You can buy and download these materials separately. You’ll find them in my shop. You can check out the book before buying. Free samples are available on each product’s page.